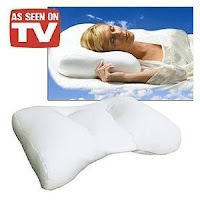 This week, the Sobakawa Cloud Pillow is on sale at Walgreens for $19.99. And since I can't seem to ever find the perfect pillow, I thought I'd buy it and try it. I already had the Sobakawa original pillow that I got at Walgreens last year. It had worked fine, but didn't keep it's shape very well so it didn't work great for side sleeping (which I do the majority of the time). Plus it was kind of hard on the side of my face and I didn't like that since I have jaw pain from teeth grinding. 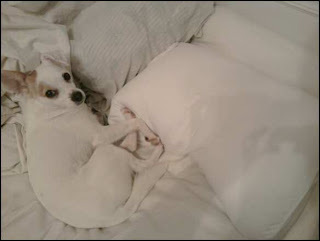 So I figured the "Cloud Pillow"must be gentle & soft! My favorite part of the Sobakawa Cloud is the fact that the outer edges are more fluffy and soft but also very dense and full, so I don't need to put my arm underneath it to keep my head propped up when side sleeping. It stays propped up on it's own! It also has a contoured head cradle area for back sleeping which is great for easing my neck pain. I usually toss and turn all night trying to get my neck and head comfortable, but last night, I slept like a baby. No joke. The Sobakawa Cloud also comes with a washable cover which is nice since the original Sobakawa didn't come with one. The instructions inside the box also say you can put this pillow in the freezer for a couple hours (in a plastic bag so it doesn't get wet) so that it is nice and cool for sleeping! Great idea for those hot summer nights! Overall, I LOVE my Sobakawa Cloud pillow. And for twenty bucks I figured why not try it? I have so many expensive neck pillows that I don't use anymore because they lost their shape or just didn't work. Compared to all of those "amazing memory foam/chiropractic" pillows that cost $40-$60 bucks, the Sobakawa Cloud takes the cake. I hope it keeps it's shape for a long time because I plan on using it forever! You can purchase the Sobakawa Cloud at Walgreens this week for $19.99. You can also purchase the pillow online with three different size options ($10 more for Full size and $20 more for Queen/King, plus shipping). First off let me say your doggie is soooo cute! Thanks for the review. I have been looking for a new pillow. I have not been to Walgreens this week yet so I will be on the lookout for it. I was lucky to find this cheapskate4life.blogspot.com website. Oh, this is a really quality post. In theory I'd like to write like this too - taking time and real effort to make a good article... but what can I say... I loiter alot and never seem to get something done.